Thomas Christiansen will get his first taste of a Yorkshire derby this weekend when he takes his Leeds United team to Hillsborough for a Sunday lunch date with Sheffield Wednesday. Leeds had mixed results in their all-Yorkshire matches last season and the Whites head coach will be looking to improve on that as it could hold the key to whether United can achieve their promotion aim this season. Competitive games at Millwall last week and Cardiff last night will give him some idea of the hot reception awaiting his team and opponents Wednesday will certainly be battle hardened after their big Steel City derby with Sheffield United last Sunday. Former Leeds defender Tom Lees remains a key defender for the Sheffield side while they have plenty of goal power with Steven Fletcher, Gary Hooper and Jordan Rhodes among the strikers on their books, the latter two with good scoring records against the Whites. Leeds are carrying a real goal threat of their own this season from all round the pitch with 11 different scorers so far and plenty of options at Christiansen’s disposal so they will not lack confidence that they can hurt their hosts as well as have to watch out at the back. 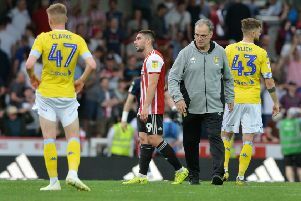 They will have to shape up better than in the first half at Cardiff when there was no punch to their passing game, but are likely to have some players back who were rested for the trip to Wales, with playmaker Samuel Saiz, centre-forward Pierre-Michel Lasogga and midfielder Eunan O’Kane all expected to return to the starting line-up. Christiansen has decisions to make at the back with Liam Cooper suspended following his sending off at Cardiff. Matthew Pennington is the obvious candidate to come in after he played the entire second half to prove his return to fitness, although Conor Shaughnessy also comes into the reckoning. At left-back, meanwhile, there is a choice to be made between Gaetano Berardi and Vurnon Anita. Whoever plays, improvements will have to be made and lessons learned from the meek surrenders at Millwall and Cardiff. Christiansen clinged to the positive that Leeds showed some spirit with 10 men in the second half in Wales. He said: “Two mistakes brought Cardiff into the game as they had not created any problems for us and then the red card was very bad for us. “There was a good response and good character and we played better with 10 men.